I try to cook pretty healthy and unprocessed most of the time - but occasionally you have to indulge! And as much as I do try to feed my kids healthy food - their favorite things are still the old classic kid foods. My kids thought this was one of the funniest things they'd ever heard - a food called pigs in a blanket - they looked at me like I was crazy! But they loved it, and ate a lot. And a couple of them even got into the making and had some fun wrapping the 'blankets' around the 'pigs'. 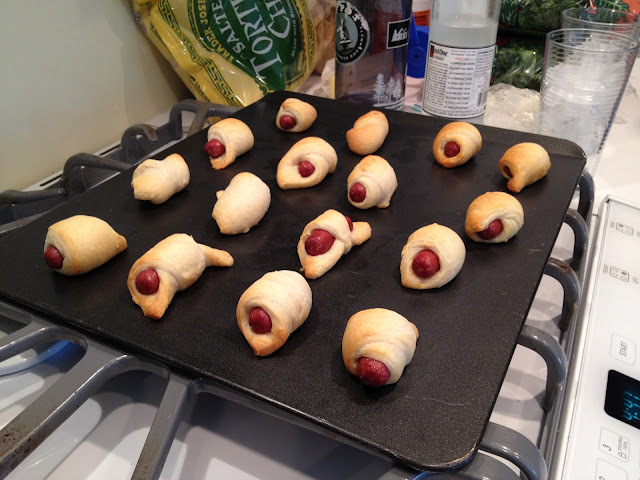 These are little mini dogs, and crescent rolls cut in half. The dogs and the rolls are from Trader Joes, all natural, no nitrites, etc. - so maybe slightly better for us than the usual grocery store brands (or I'll tell myself that anyway).